Now, a series of portraits by Jim Agpalza. And there will be plenty more art coming out of the bizarro community. We’re all heading into a new and strange era, but whatever the future holds, it’s not as weird as we are. 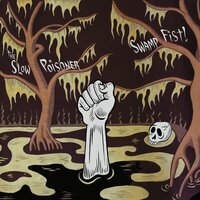 The Slow Poisoner releases… Swamp Fist! The Slow Poisoner, that one-man surrealistic rock and roll band, has released his latest album: SWAMP FIST! Individual tracks and the entire album can be purchased here. If you’ve ever heard The Slow Poisoner’s music or seen him play live, you know that this album is chock full of auditory oddities that make even the dead tap their toes. If you haven’t heard The Slow Poisoner before, then get this now! It’s the perfect music for the Halloween season. To see the Slow Poisoner in concert is to be amazed and enthralled. He presents a carefully curated program of original tunes and well-chosen covers complete with costumes, props and set pieces. And he does this all by himself! One moment he might be wearing a giant mushroom hat much bigger than his head, and another he might be performing from inside the mouth of a hideous monster with wicked looking teeth. One of my personal favorite Slow Poisoner songs is “In the Gloom,” sung with only the sound of a heavy chain being dropped as accompaniment. The use of silence in between the plaintive lyrics and bursts of harsh metallic clanking is masterful. LEE: Can you give me a brief history of your musical career and the creation of The Slow Poisoner as a performing entity? ANDREW: Almost exactly 20 years ago, I was in Paris and I got the idea to form a band called The Slow Poisoners. In the 18th century, there was an epidemic of poisonings in France – mostly women doing away with their husbands, by a daily sprinkling of arsenic (or diamond powder or even spider bits) on their gentlemen’s meals. It was documented in a book called A Memoir of Popular Delusions and the Madness of Crowds, by Dr. Charles Mackay. I recorded some demos with my brother Ed (who now does the music for Pokemon) and put together a live band, which was originally a quintet, including two cellos, which sounded terrible. Luckily, the number of members dwindled as time went by, and come ten years later it was just me. I scratched the letter “s” off the end of the name on all the merchandise and carried on as The Slow Poisoner. I also switched from drinking absinthe to drinking whiskey, which led to a more rock ‘n’ roll sound than the first few records which were more of the chamber pop variety. LEE: Have you always been involved in multiple art forms, or were you an artist first, or writer or musician or what?? ANDREW: I’ve always done both music and visual art. I started drawing cartoons in 2nd grade; I had a superhero called Toilet Man who faught crime while flying around in a toilet. I drew another one called SuperFunk, whose super power was just being funky (whatever that meant to a seven year old). My first band was in fifth grade – we called ourselves “The Sound Barriers” and we performed “Sgt. Pepper’s Lonely Hearts Club Band” at the school talent show. I was on electric piano. Two of the members are now dead. LEE: How did you discover and then become involved in the Bizarro scene? ANDREW: In the late 90s there was a pre-Kindle electronic reading device called the Rocket E-Book. A friend of mine was publishing content for it and suggested I write a story based on my song lyrics, which became “Ballad of a Slow Poisoner.” For a brief period, it was outselling both Stephen King and the Bible. 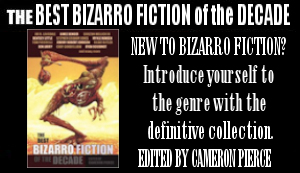 Carlton Mellick read it at the time, and a few years later asked if he could re-print it as part of a publishing imprint he was just starting, Eraserhead Press. 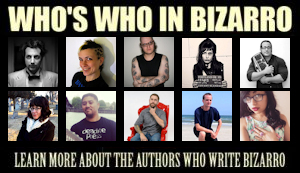 He wrote me a letter explaining that he was a writer but what he really cared about was promoting this new literary movement called Bizarro. I went to the second BizarroCon and at that point I knew I had found my people. The next video is animated by Goldfarb himself! Is there anything this guy can’t do?? The last video is the Slow Poisoner’s magnum opus. “Hot Rod Worm” should be playing on every radio station in the country! It’s catchy, it rocks, and it has an important message! Stop Motion Animation by Michael Granberry. Bongos by Bizarro legend John Skipp. Directed by John Skipp and Andrew Kasch. I’ve had a fondness for multi-instrumentalists and one-man bands most of my life. As a child my favorite scene in Mary Poppins was Bert busking and making up songs about his audience while he simultaneously playing an accordion, trumpet, horn, and drums strapped to his back that were triggered by strings attached to his legs. As I matured, so did my taste in music, but always I found myself drawn to the solo musicians who took it upon themselves to craft every shape in their sound. Even my first Unearthly Sounds article was about a one-man band. J.W. Wargo: Tell us of your origin. Were you born in the swamp, under the swamp, over the swamp, or just near the swamp? The Slow Poisoner: I was born into a metaphysical swamp, as are we all. The origins of my swamp obsession actually go back to a seedy carnival I passed through in the mid-1970s, when I was around seven years old. It was at the midway of a county fair; after looking at pigs and flowers all day my parents were trying to find their way back to the parking lot as night fell. They dragged my brother and I through what seemed like an endless corridor of creepy amusement park rides, most of them luridly-painted haunted houses, the kind of ride with little two-seater cars that go on a track through a series of black rooms with day-glow mechanical horrors. I was especially struck by one featuring an animatronic old man in front of a spooky bayou scene. He was gibbering about the demons that dwelled in the swamp, and warning people not to come inside, as glowing yellow eyes blinked from the sinister trees that surrounded him. It thrilled and unsettled my childhood mind, especially in conjunction with the carnies that I glimpsed in the shadows behind the dark rides, making out with their girlfriends… I figured that this was what the adult world was really all about. JWW: Being in a one-man band, does your right foot ever get tired of the drummer jokes? TSP: All those drummer jokes are true, which is why I became a one-man band. Collaboration (with other humans) can potentially be a wonderful thing, when you get artists that can harmonize together to explore further in creative directions than they would on their own. At other times, however, collaboration will just dumb ideas down to what all parties involved are comfortable with or understand – this is especially true of rock bands, who often have to find their secondary members through posting want ads. Inevitably, it’s the drummer that will suggest doing Stevie Wonder covers. One thing I like about one-man-bands in general (not just my own) is that there’s a singular intensity of vision that goes undiminished by other parties’ ungainly participation. That said, I make a happy exception whenever John Skipp can join me on bongos. JWW: Describe your process a bit. How do approach your songwriting? What generally comes first, the words or the music? TSP: I’ll usually get the title first, and then I have to wait around for some suitable notes and chords to come to me by night-wagon. Sometimes it’s a long wait. I had the title “Flaming Arrow” on my to-do list for a year, but none of the music that slithered out of my hands was quite flaming enough. Eventually, if I batter at my guitar endlessly while repeating the title like a mantra, the right melody will come along and I can then introduce it to the title. The rest of the lyrics then assemble themselves from there, like rats coming out of a hole in the wall. JWW: I heard the last bottle of “The Slow Poisoner Genuine Enervating Elixir Miracle Tonic” was recently sold. Did you ever have to dodge any assassination attempts by the American Medical Association while you were still in the Magick Potion business? TSP: I advertised it as being a cure for consumption, women’s troubles, gout, neuralgia, wandering limbs, stoutness, onanism, disinterested bladder, elephantiasis, cholera, barnacles, boils, the fits, excessive abscesses, necrosis, lavender fever and general wasting, but I also received a testimonial from the Midwest that it was effective in getting rid of whooping cough. I always found it to act as a mild stimulant, myself. I did get a warning from a guy that worked at the FDA, but it wasn’t an official thing; he just happened to be at one of my shows. After a few years I ran out of ingredients, and figured it was time to pursue other endeavors. JWW: Your live performances incorporate your own beautifully drawn art/set pieces and you sprinkle amusing anecdotes between your songs, giving your shows a truly interactive feel. This concept came together seamlessly in your latest album, Lost Hills, an epic, 10 song Swamp Rock Opera complete with narration and illustrations. Musician, Painter, and Storyteller. Would you consider yourself a modern day Artistic Renaissance Man? TSP: More of a jack-of-all-trades-and-master-of-some. My only ambition is to share a certain weird mood – a sense of surreality that appeals to me and that I believe will appeal to at least a handful of others. Using different mediums betters my chances of conveying this atmosphere, since art and music express ideas from different angles – like opposite walls of one crooked house. I’ve gotten interested in video too, plus a bit of acting and I write an advice column. Also, I think it’s important to stay productive and continually create new work. Having a short attention span, it’s easier for me to be prolific if I vary the format. I get bored of singing songs all day, so I go and paint a picture after a while. JWW: Has Ogner Stump, the protagonist of your long running “One Thousand Sorrows” comic strips, ever made an appearance in your music? TSP: Not by name, but the narrator of Lost Hills was a similar character, in that they’re both semi-autobiographical avatars. The setting for my comics and my songs is the same, though, in that it’s just an exaggerated and stylized (or maybe unfiltered is a better way to put it) version of the “real” world – a place of swamp witches and cosmic horror, where bizarre creatures of every stripe are engaged in sinister pursuits in murky places. This hollow planet that we live on is actually bursting at the seams with trolls and goblins, slinking across a shifting and exotic landscape of weeping foliage and sparkling elixirs. If you give the eye-window a quick wipe, the feathered beast is clear to see in all its speckled, scaly glory. JWW: Let’s hold a seance: …..MMMMMHMHMHHMMMMMMNNNNMNMMHNMMHHMMM….. Tell us, oh great and salty snack-size spirits! What does the future hold for The Slow Poisoner? TSP: In the next few months I’ve got a solo art gallery exhibit of my black velvet paintings happening in Hollywood, plus I’ll be putting out a new album, titled “Ever Been Chewed Upon By Teeth As Sharp As Knives?” I plan to do some touring in the summer, and new Ogner Stump strips will appear in the Magazine of Bizarro Fiction. In the greater distance, I have two more rock operas in development; I think the first will see the light of day in the 2020’s and the second sometime in the 2040’s. Both are based on real events, one of which is a secret and the other being a re-telling of the Air Loom Gang of the late 18th century. The Air Loom Gang (the Middleman, Glove Woman and Sir Archy) were pneumatic practitioners engaged in the nefarious psychic torments of political enemies by means of magnetized lobster-cracking, stomach-skinning and apoplexy-working with a nutmeg grater, not to mention sordid lengthening of the brain. Don’t forget to check out The Slow Poisoner’s latest music video Hot Rod Worm! The Slow Poisoner is a one man surrealist rock band based in San Francisco. 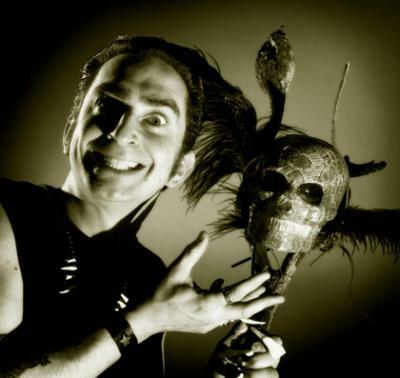 He travels the west coast with his guitar, bass drum and props, spreading his sly stories of the mysteries and horrors of the denizens of the fringe. When not performing wherever he can, he is busy writing, illustrating, throwing hexes in the woods and spreading the word on his genuine invigorating miracle tonic. I ran down The Slow Poisoner for some questions to get a grasp on his creative process and what it takes to keep him motivated. Horatio Dark: I first heard Run Rooster Run when was looking up the story of Miracle Mike, the headless chicken, after someone mentioned him at my local bar. Is Miracle Mike the inspiration for the song? Slow Poisoner: When I first wrote Run Rooster Run I was just thinking about the few minutes that your average chicken spends post-amputation, flapping bloody about the barnyard. At some point I learned about Mike the Headless Chicken, and became pretty obsessed. I started to tell the story before playing the song, as a kind of motivational speech about triumph over adversity. I even traveled all the way to Fruita, Colorado during a tour in order to see the town where the incident occurred. They have a statue of him in the town square, made out of rusted wrenches. The Chamber of Commerce sells a very strange DVD about it, called “Chick Flick,” and of course they have their annual headless chicken races – with people dressed as chickens. I was especially struck by the fact that after two years of exhibiting Mike, his owner got too plastered one night and left the feeding syringe back at the carnival, so Mike “the living miracle headless chicken” starved as a result of one man’s drunken failure. A strange, lonely death. HD: How’s the miracle tonic selling? Have you thought of branching out into snake oils, elixirs or other panaceas? SP: The patent medicine sales are good. Lots of folks are suffering from elephantiasis and disinterested bladder these days, not to mention lavender fever and wandering limb syndrome, so as long as folks are sick I think I’ll continue to offer it, though it’s been more of an under-the-counter item lately as I’ve had some warnings come my way. It’s dovetailed nicely with my advice column “Ask The Slow Poisoner” which is in a magazine called PORK, wherein I dispense with all manners of helpful information. My best-selling merch is my black velvet paintings, though. HD: In addition to being The Slow Poisoner, one man surrealist rock band, you are Andrew Goldfarb, author and illustrator. Tell me about the interplay between Andrew Goldfarb and the Slow Poisoner. SP: As for the connections between my writing, art and music – I see it all as being the same thing, really. I display paintings for each song when I perform live, or sometimes I use felt cut-outs to illustrate what I’m singing about. I act out my rock opera, “Lost Hills,” and recently I built a giant monster head that will swallow me on stage, so visual stuff is a big part of the music show. Some of the songs have become comics, like “The Hex”, which is an instruction manual to the black arts that appeared as a song on my 2nd album but also as a comic strip in various places. It’s all about getting a certain mood across, inviting folks into some weird place that I’ve been to on occasion and that I want to share with others. To that end, the more media that I employ the more effective it all is. HD: The life of a one man band has to get to be trying at times. What keeps you motivated? SP: Being a one man band is actually very easy, especially when compared to having drummers and bassists to contend with (although bizarro writer John Skipp has been joining me on percussion sometimes and he’s fantastic). There’s a law of physics that an element in motion with no opposition will remain in motion in perpetuity, so I plan to carry on ’til I’m 100 and go over Niagara Falls. As for motivation, I tend to employ numerical goals to keep me on track. I aim to do at least 31 shows per year, and I have 1000 episodes of my comic strip (“Ogner Stump’s One Thousand Sorrows”) to complete, so I stay busy and avoid staring into the endless black abyss. HD: With that kind of workload, you must need to keep a rather consistent flow of ideas. How do you deal with creative blocks when they arise? Any day to day habits that keep you focused? SP: I’ve found that napping is really important to my creative process. I got to sleep at least twice, sometimes three times a day. Perhaps it’s narcolepsy. But after I wake up, whatever my first idea is, I go with that. So when I get an idea for a song or comic, I run with the first fool notion that hits me, I don’t judge whether the idea is good or bad – I’ve learned that I don’t know the difference. I’m just happy that I have any idea at all. In a sense, I think quantity is more important than quality – if you make enough stuff, some of it is bound to be good. HD: All of your music is put out by Rocktopus! Records. Is it a fair assumption that Rocktopus! is you? What are some of the ups and downs of putting your music out yourself? What have you learned that you would do differently if you could? SP: Yeah, Rocktopus! Records is my own label and it just has me on it. I believe in the Gideon Bible method of distribution – I slip CDs into hotel room drawers, under the windshield wipers of interesting cars, I tuck them into pamphlet racks at government bureaus. You never know who will come across it. I don’t have any complaints, though it is nice to be part of something bigger on occasion, as with Eraserhead and Bizarro, for the human interaction with fellow freaks – it’s always a pleasure to be among other folks treading the weird path. HD: Tell me about how fans and community have affected your process. SP: Audience reactions have definitely shaped my music performance – the difficulty of reaching into folks’ brains in dark bars has led me to become increasingly over-the-top musically. I used to perform delicate ballads of ethereal mystery, but I couldn’t hear myself over the sound of the bartender, so now I scream about cutting off chicken heads and throw eyeballs into the audience, and everyone has a better time, including myself. HD: Now that everyone is captivated by The Slow Poisoner, where can we find more about you and your work? SP: I’ve got a couple of Internet sites – my music stuff is at TheSlowPoisoner.com and my comics and art is at OgnerStump.com. 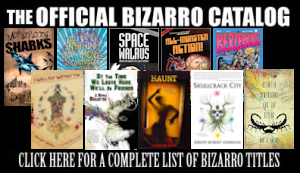 I contribute regularly to the Magazine of Bizarro Fiction, and people in the Western half of the US can catch me on tour a couple of times a year – in only the finest lounges, cafes and laundromats.